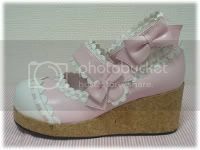 As promised, here is my pair of Sweet Cake Shoe replicas from Coser Dream. You can definitely tell the difference between this replica and the Angelic Pretty original. But they are consistent with the stock imagine from their auction page. Coser Dream was wonderful. I gave them the size of the shoe I wanted but to make sure that my shoes fit they asked me for a measurement of my feet. It took about 3 weeks for my shoes to arrive. The box was slightly dented in a corner but there was no damaged to the shoes. My shoes fit perfectly! I wore them all day Saturday to the VGXPO and had no foot pain. I would recommend giving a centimeter or so extra when you order this shoe style for the purpose of the longer Velcro straps. Every once in awhile the strap across my foot would un-Velcro if I flexed my foot too quickly. Small scuffs are easily rubbed off the material. The bows appear to be glued on, but are rather well attached. The Velcro is sewn on well. The soles of the shoes have a slightly gripping rubber which I was thankful for because the show room at the VGXPO was not carpeted. The white scalloped material is very soft so no worries about them scratching your tights. The wedge soles of the shoes are hard so if you plan on wearing the shoes repeatedly for long periods of time a cushioned insole is recommended. The available colors for these replicas are White/Cream/Pink/Orange/Red/Wine Red/Gold/Silver/Blue/Black. Until I am able to find a better looking replica I plan on order a few more pairs of these shoes. Thank you for the review! They had one style of shoes that I am still interested in. I need to ask if they offer dark blue. Cute! I dislike the AP originals because of the cork platforms, and the replica looks cuter for that! Only, I do not like how the scallops overlap in the front :( But they are still very sweet looking and it is great to hear that they are good quality and have good customer service! I think both the AP & Replica are adorable!